Wow. That went fast. I cannot believe January is over already. It was a great month. We had such a great trip to Florida. 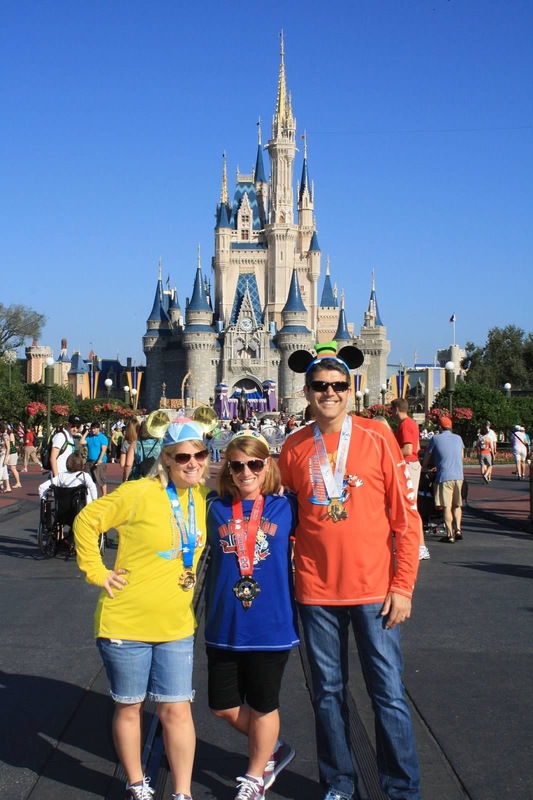 First for some rest and relaxation by the pool/beach on Anna Maria Island with my parents and the boys and then on to all the fun and memories that was our Walt Disney World Marathon weekend where I completed my 7th Half Marathon and 4th Full Marathon. I’ve logged 130 miles this month although 42 of those were in one weekend alone – does that mean I was slacking the rest of the month? Apart from a couple of days prior to the Florida trip when I was trying to rest my right knee and a couple of days post Goofy Challenge I have pretty much been back to my 5 days a week training plan. The New Jersey Marathon is three months away and we also have the April Fool’s Half Marathon in two months down in Atlantic City, NJ. Other than our Florida trip and a couple of weekend runs since getting home I have been confined to running indoors on the treadmill. The temperatures were in the 20s for more than a week and I just didn’t feel that I wanted to be that uncomfortable. I can run outside in the cold (believe me I have the gear for it) but I run early in the mornings before I head off to work and it is still dark at that time and the last thing I want to do is slip on the ice. The other reasons I was indoors was to go easy on my right knee (it’s softer to run on the treadmill than on the road) and my shoes are very good at letting heat escape (well designed for most weather) but not good at retaining heat when needed. I did venture out for a midday run last week and it was so cold I couldn’t really feel my toes by mile 3. Not fun. We still have February and March where we could possibly get some snowfall so I am sure I will be seeing the treadmill many times in the next few weeks. Oh well. Believe me, in the summer when it is in the high 80s and 90s I’ll be looking at the treadmill again but for different reasons. The good news is that the days are getting longer and soon I will start to run outside more often. 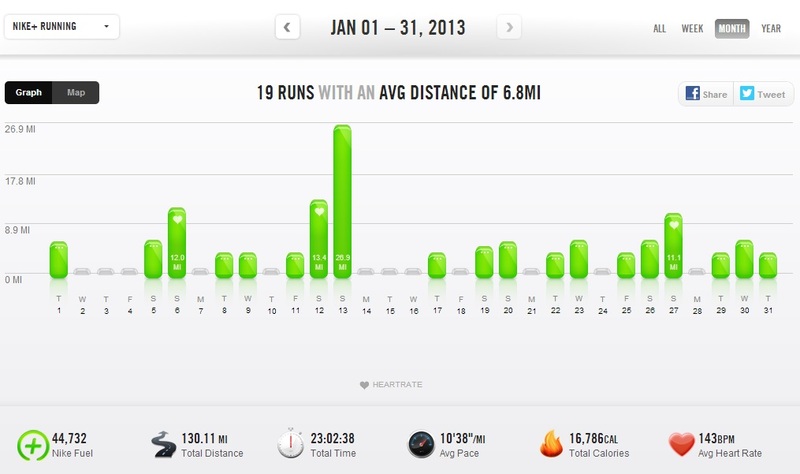 I started off the year with a strong month and managed to keep injury free. I’ll take it. Roll on February. 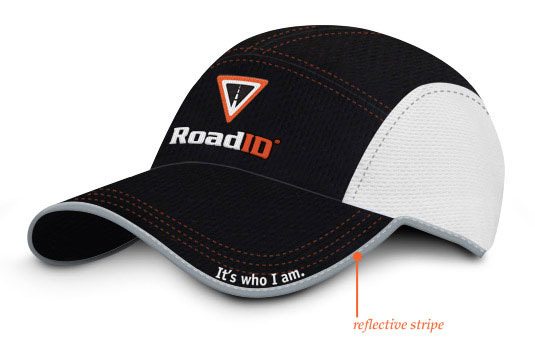 Road ID is the type of product you need but never hope to use. It could in all reality be a life saver. 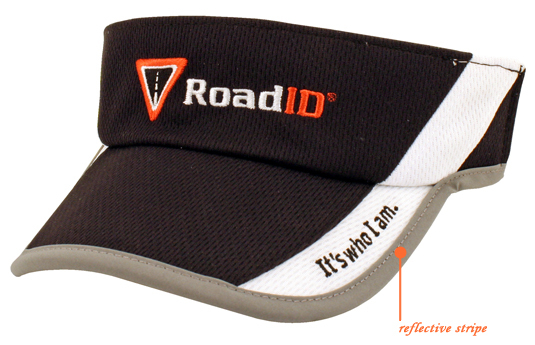 Road ID (www.roadid.com) sells a number of safety products for runners and cyclists that provide a form of personal ID in the event that you are ever incapacitated or unable to help yourself for whatever reason. I have a few of their products; a ‘Wrist ID Sport’ which I wear for running and cycling, a ‘Wrist ID Slim’ which I wear at all other times (I drive over 100 miles every day round trip from home to work) and a ‘Supernova’ high visibility light. They also sell a ‘Shoe ID’ which attaches to your running shoe and you never have to remember to do anything with that until you swap your shoes out. With the IDs there are two types – ‘Original’ and ‘Active’. The ‘Original’ ID is just that. You list your name and any information and phone numbers you think would be helpful. I purchased the ‘Original’ for my father to attach to his golf shoe. He lists his name and birth year (so first responders can tell his age), shows that he has a heart condition and lists his home number, my mother’s cell number and my cell number for when he is in the US. I purchased the ‘Active ID’ for both myself and my wife (she has the Shoe ID). This lists my name, birth year, the fact that I wear contact lenses and has a call center number 1-8XX and web address for first responders to connect. On the back there is a serial and pin number. The first responder can call this call center number and this is where the ‘Active’ part comes into play. With the ‘Active’ ID you set up your personal information on a secure site which allows you to document significantly more information that one or two lines on the ID. This has a list of emergency contact numbers, my medical insurance information, my family doctor/dentist/ophthalmologist contact information and lists, my medical history and any current medications. The good part of this is the Emergency Responders are now familiar with this type of product and will look for it. There is an annual fee for this service and in my opinion it is worth the cost when you take into account what you pay for race entry fees and other running gear. The products are designed for areas of the body (wrist, ankle) where typically an EMT will look for a pulse so they should be easily noticed. The other product I use is the ‘Supernova’ light. It is a really bright light that I attach to the back of my hat when running in the early hours when it is dark. It is so lightweight you will never notice it. They make accessories to go along with the light such as wrist bands and bike attachments. Its pretty inexpensive and worth the cost. RoadID often sponsors races and the bibs typically include a $1 coupon that you can use to order products. If you look around you will probably see discount coupons around the internet or in mailings. It is something I hope I never have to rely on but it does give peace of mind knowing that I have a ‘backup’ system out there. If you visit the site don’t forget to check out the apparel section. I purchased a couple of running hats and a visor. They are made by Headsweats which is a great brand too. I find them to be perfectly comfortable and perform as designed in keeping me cool and dry during my training and races. 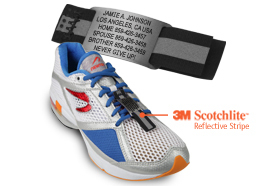 They have the RoadID logo on them and plenty of reflective material so I use these on my early morning runs. As they are essentially promotional items they are discounted over the regular non branded Headsweats gear and are a great value. You can purchase directly from their site using this link. 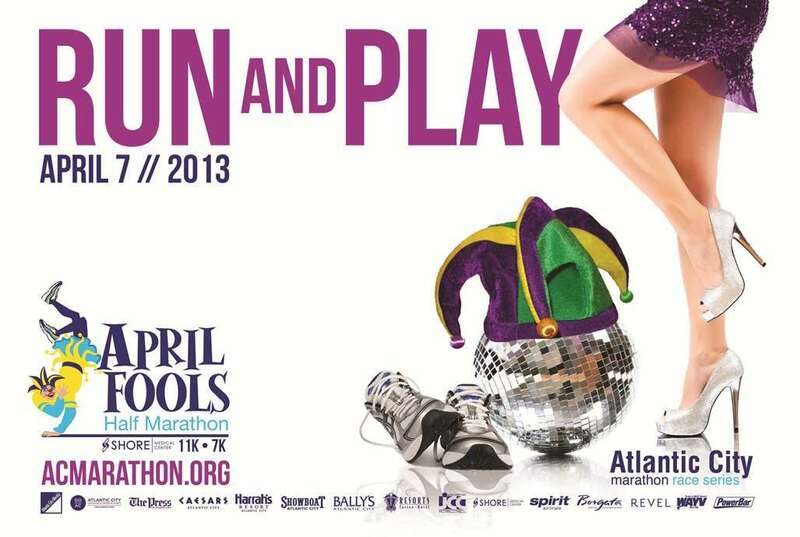 We decided to sign up for the April Fool’s Half Marathon in Atlantic City on April 7th. 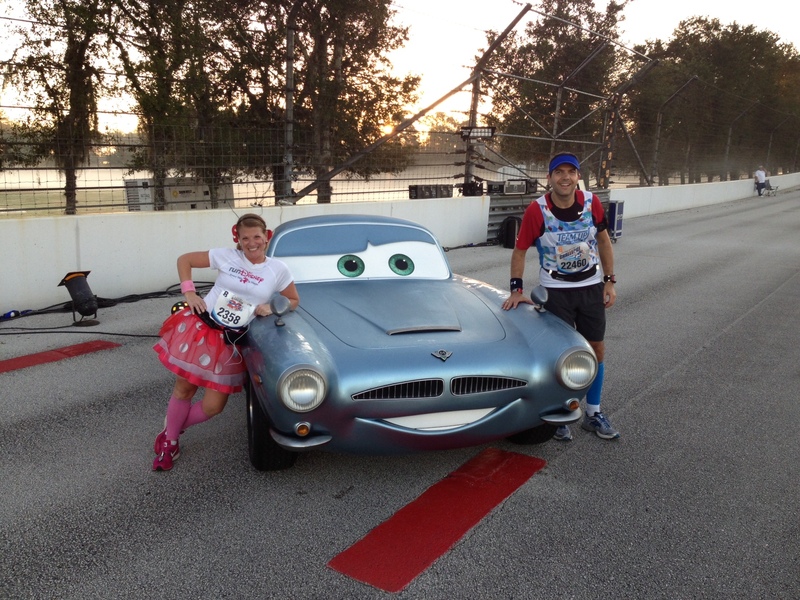 Shari and I ran this last year at its inaugural race. 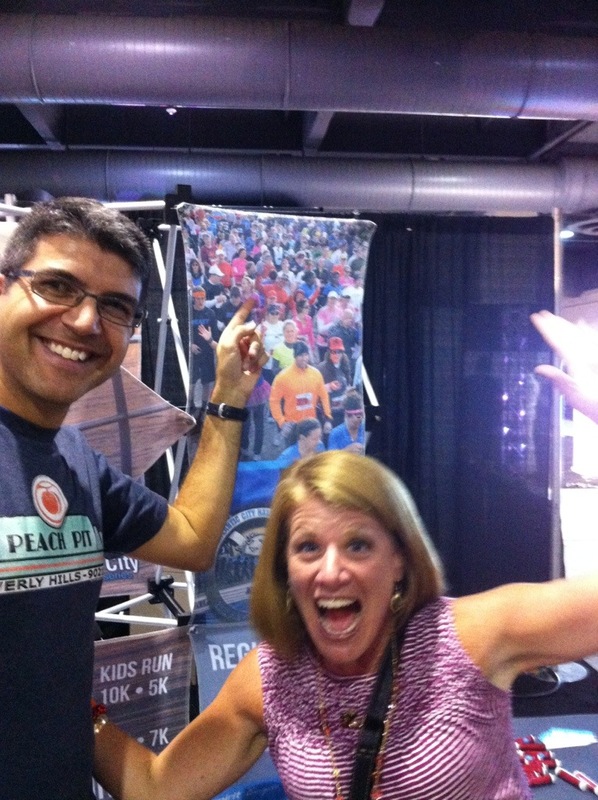 I guess we are obligated to do this again after all our picture made the cover of the brochure for the 2013 race and we are also on the marketing banner which we saw on display at the Rock and Roll Philadelphia and Philadelphia Marathon expos. You would think they may offer us a free place this year for our continued uncompensated representation. LOL. 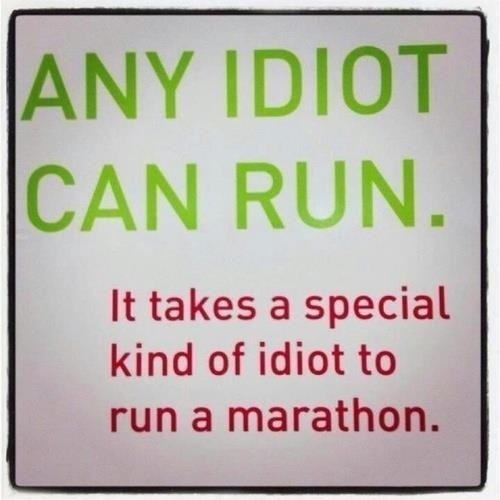 This actually fits in well with my training for the NJ marathon. Not quite sure yet if I want to race this event and try to beat my PR which I got in the race last year. It is a nice flat course along the boardwalk in Atlantic City and then out and back through Ventnor, Margate and Longport. The temperatures last year were ideal. 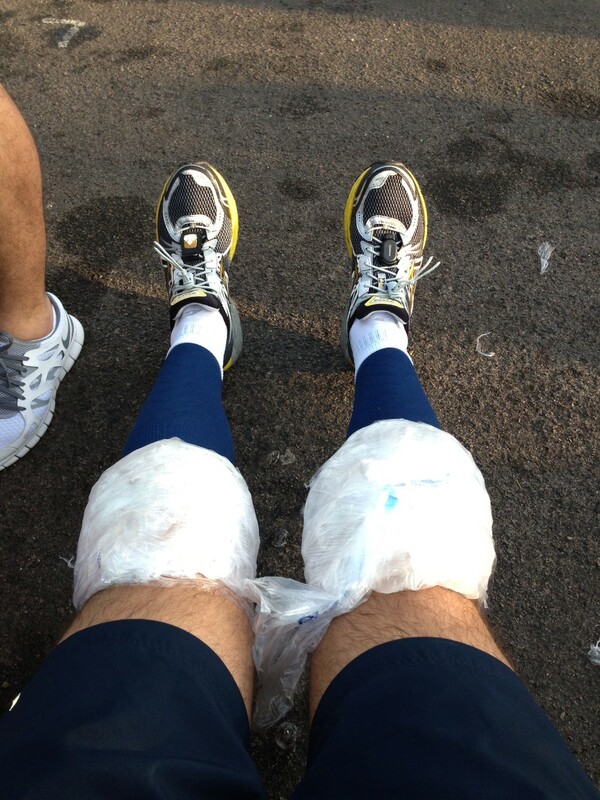 I think it was one of my first outdoor runs in 2012 when I was able to wear shorts outside again. So yesterday evening runDisney issued a heat advisory warning due to the high temperatures expected for the Marathon. On Facebook I saw a post saying that the local hospitals had called in extra staff as a precaution for anticipated increase in volume of patients…we had been drinking fluids frequently during the previous couple of days just to be safely hydrated. The alarm went off this morning at 2:30am…woo hoo…an extra 30 minutes of sleep from the day before. Actually I had slept really soundly last night as I was so tired. 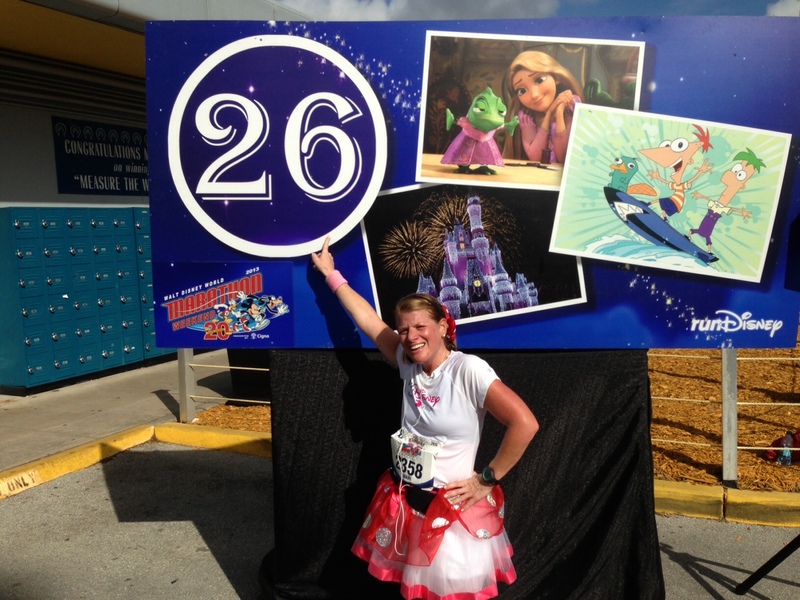 I already had a 5K and a Half Marathon plus two theme parks done, only a Marathon to go. We both got ready in silence so as not to wake Rina and the boys in the next room. It was eerie as we were probably both a bag of nerves. We headed down to the lobby of the hotel where we were meeting our friend Beth who was also running the Full. Having a passenger with us as we were driving to EPCOT and having someone to talk to all the way through to the start line is the best distraction we could have. It really helped relax us before the start. In future I will make sure to wake my friends in the early hours before I head to any race just for company (although I probably won’t have many friends left after that). Like yesterday I got the directions right but unlike yesterday the volunteer in the car park directed us to the far end of the far right parking lot which led to a decent walk just to get to the bag check area. Where was the monorail or a Fast Pass when you need it? Either way, it got the muscles warmed up a bit. Unlike yesterday I made sure we went straight through the bag check and met up again on the other side. I didn’t want to get stuck in the human traffic jam that happened in the Half Marathon yesterday. You don’t want additional stress just trying to get to your corral. It was fine today. Shari, Beth and I walked slowly and carefully to our corral. It was dark in spots and some people did trip up on the way to the start line (not good). We were all in corral ‘B’ and were there early enough for the pre-race stuff. We heard interviews and advice from Jeff Galloway (I’m a Galloway propenent), Frank Shorter, Joey Fatone, Bart Yasso and Bill Rodgers. We sat in the corral for a while watching the video screens and I realized this was probably one of the few times during the weekend when I wasn’t on my feet. And before you knew it we were ready to go. I gave Shari a good luck kiss and off we went. It was cool at the start but we knew that it was going to get warmer. We took advantage of the early water stops and the first few miles seemed to go by pretty fast. We didn’t stop for the Pirates of the Caribbean today as I had promised Shari we would do many of the Princess photo ops when we got to the Magic Kingdom. We were obviously drinking enough over the last few days as we had to stop within the first couple of miles to use the port-a-potties again (more on that later!). As we approached the entrance to the Magic Kingdom transportation center we could see the Speedway on our left. Shari noticed the silhouette of Mater and I also noticed Lightening McQueen. I was really looking forward to that part of the course. As you get closer to the park and see the Contemporary Resort you could feel the excitement building. It was nice to have someone to share it with who wasn’t a complete stranger. There is a small underpass as you approach the park. I overheard a fellow Goofy runner say that they must have made the uphill part steeper over night. Ha! Once we entered the park it was pictures galore. We stopped a couple of times on Main Street USA, we stopped in Tomorrow Land to meet Buzz Lightyear and then stopped for photos with every Disney Princess you could imagine. Shari had her pose down pat by the time we got to the Castle. Shari was on such a high at this stage that she wanted to do her usual ‘jump’ shot. I had to remind here that we had another 20 miles to use those knees and that we should wait until we had our medals. She did thank me later. Finally we got our photo together in front of the Castle. Priceless. 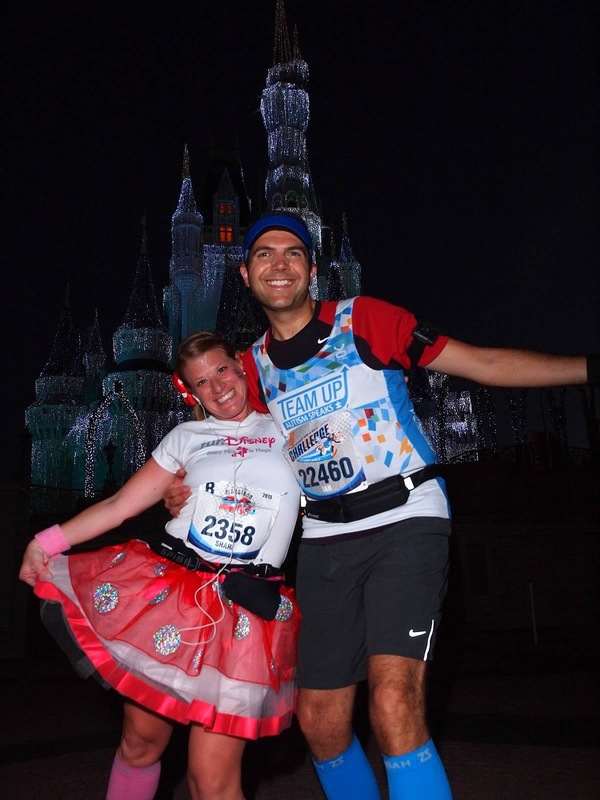 After Magic Kingdom we headed over to the Speedway just around mile 8. We had still been drinking all the way but the sun was now up and warming all the runners. Little did I know that this would be the last port-a-potty break of the run. Wow. As you enter the Speedway there was a steep drop into the circuit. Steep was an understatement….holy moley…glad it wasn’t uphill. The Speedway was set up like a classic car show and right at the halfway point we got to take pictures with Lightening McQueen, Mater and my fellow Brit Finn McMissile. Nice. After the Speedway we entered the long stretch past the water treatment plant on the way to Animal Kingdom. As you run you cannot help but notice the smell…its very un-Disney. Also as it was heating up it didn’t make you feel that much better. It was around here, miles 10-12, that my foot which I had tweaked running into EPCOT in yesterday’s Half Marathon started to hurt. I had never had to stop before in a race but I had to stop a couple of times over that stretch to take my shoe off and massage my foot. I use speedlaces which are elastic and allow room for feet to maneuver but I just couldn’t get my right shoe to feel good. Shari advised me to stop for some Tylenol at the medical tent but I didn’t want to try something new during a race having never taken medicine before in a race. We both stopped to take advantage of the BioFreeze. Big tip – look for the volunteers with towels at the med tents to wipe your hands. We saw plenty of people later in the race with BioFreeze hands who inadvertently wiped sweat away from their eyes. You can only imagine how that feels. OUCH. We finally made it to the Animal Kingdom. It was nice to have some shade as the temperatures were continually rising. I loved the fact that a Disney employee was telling us when and where to smile as we ran through park for the photographers. We got plenty of cool shots with Minnie, Daisy, Mickey and Pluto. I found out from reading someone’s post on Facebook that they stopped to take a ride on Expedition Everest and grabbed a soda to cool themselves off before continuing and finishing the Marathon. I told Shari this after the race and she was like “We could have done that?” I also saw someone post their GPS route from the ride. LOL. Getting out of Animal Kingdom was pretty much a walk. It’s a very narrow walkway and we got stuck behind a 5 hour pace group (yes, we had really stopped so many times). Once free of that we headed out on the stretch to ESPN Wide World of Sports. The heat was on now as we made our way to the ESPN. We were grabbing extra water at the water stops and pouring it over our heads. I’d never had to do this in a race or in training before. It had been a while since I had a bathroom break but as I was still able to sweat I knew I had to be somewhat hydrated. I heard after the race that over 4,500 people either dropped out or were pulled off the course because of the conditions. I wasn’t surprised. Shari was doing well. She was hanging on and we were still together. The ESPN zone seemed to go on FOREVER. Seriously, there were left turns and right turns and it was just hot. There was a little shade in places but you had to keep going. I stopped again to massage my foot and caught up with Shari just before we entered the running track. Wow, was that bouncy? Not sure at 19 miles I benefited from the soft surface. I don’t think it did my knee any favors. We then entered the baseball stadium. Most folks said they liked the change in texture under their feet (it was sandy/grit) but after a few thousand people had run over the inside track it was far from even. Somehow we missed the wet sponges they had passed out at the first water station in ESPN. That was a shame. As we exited ESPN the heat began to hit again and we did have to walk for a minute or so. After ESPN we reached what was to be the high point. The 20th mile celebration. I will be honest and say that I was expecting much more. Although a photo op with Mickey is never a bad thing. The best part about this was that we seemed to catch our breath and recapture some of our energy along this section. Mile 20 last year was where I began to struggle and it was way cooler than this year. As we passed the 20 mile marker Shari hadn’t realized that we had passed the ‘Spectacular’. From what I have read on line she wasn’t the only one. Next up Hollywood Studios. It seemed to go pretty fast. I guess we had our second wind. Before you knew it we were passing over the timing mat at 23 miles. I turned to Shari at this point and said its only a 5K left. She looked at me and started to cry. The only thing I could say was to be careful not to cry too much as she needed to retain fluids in this heat….romantic, huh? Just the Boardwalk to run and then back into EPCOT. It was hot. I was tired. I didn’t want to let Shari down. She was doing great and I could see she was getting very emotional at this time. As we turned into England (nice) in the World Showcase and turned right through the countries the realization began to sink in that we were pretty much done. 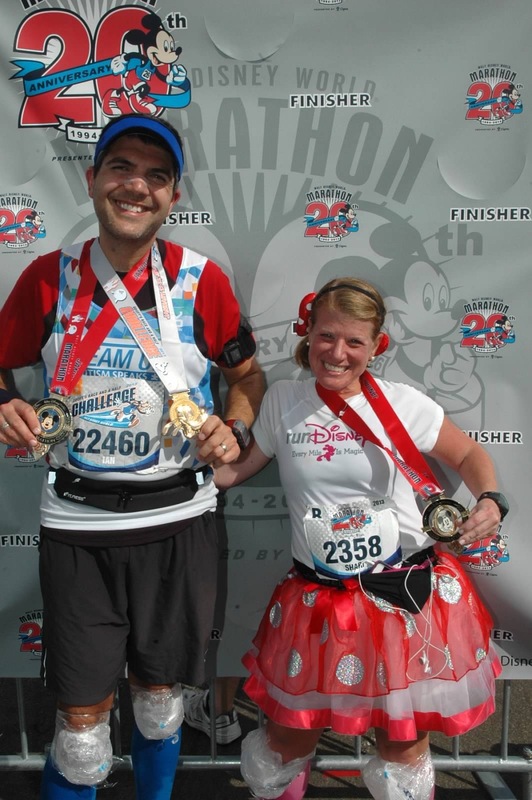 Shari had run her first Marathon and I was completing the Goofy Challenge. 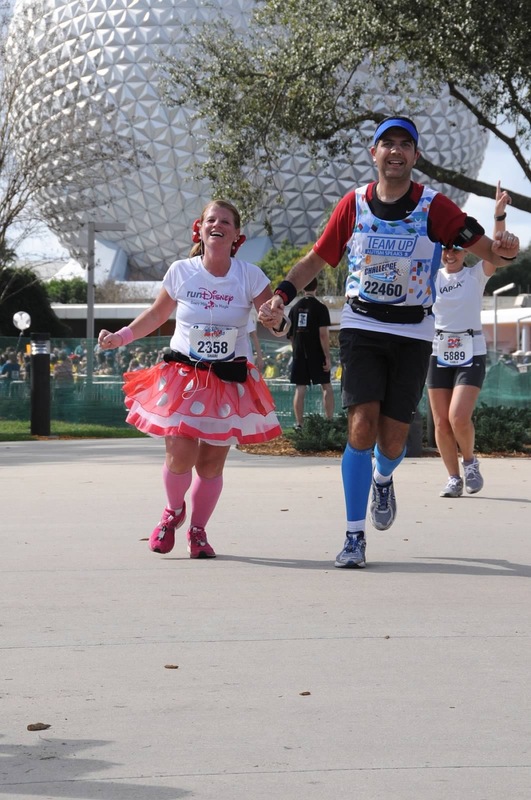 As we reached the front of the park and passed by Spaceship Earth I made sure everyone knew that Shari was completing her first Marathon and ensuring that they cheered her on to the finish. 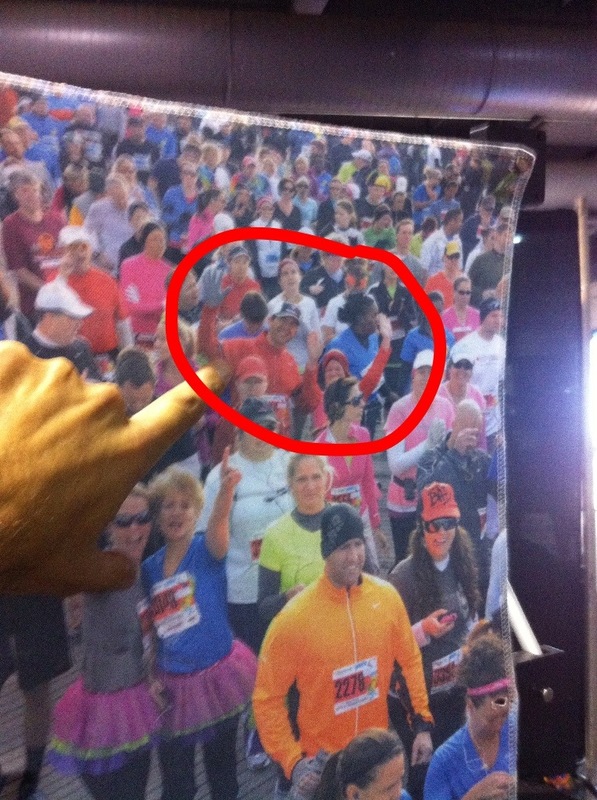 We stopped at mile 26 for a photo and I saw the choir. 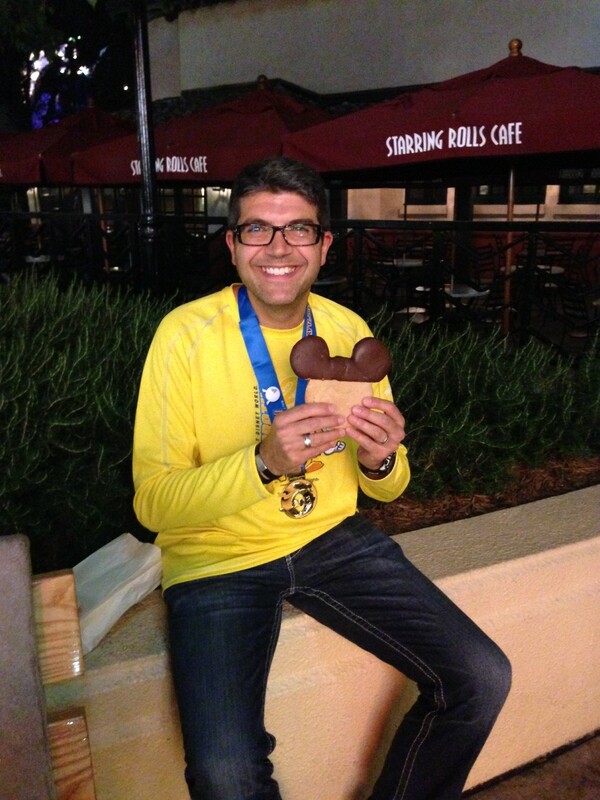 I had been waiting for this moment since Saturday morning’s fireworks at the start of the Half Marathon. 26 miles. We made it. We saw the finish line and ran hand in hand together. 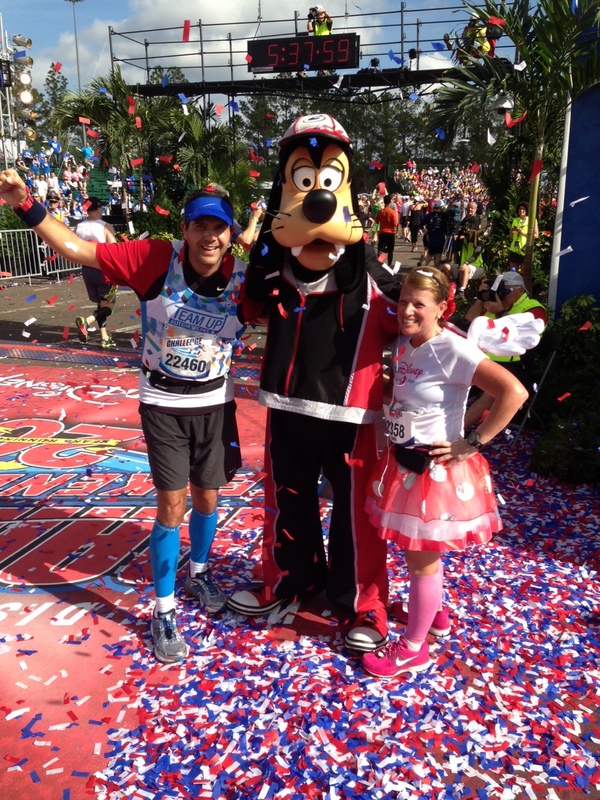 We stopped just short of the finish line for just one more photo op with Minnie and with Goofy. 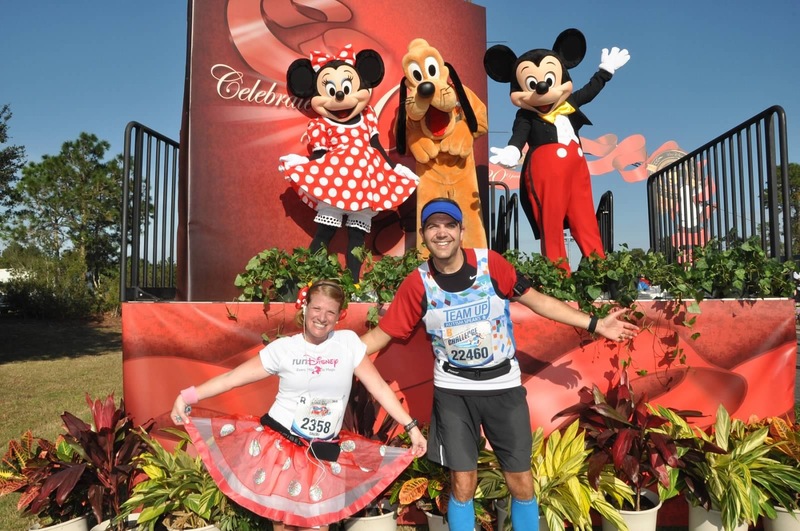 As I was having my photo with Goofy, Shari turned and headed to the finish line and finished 2 seconds ahead of me….she had to beat me, right? 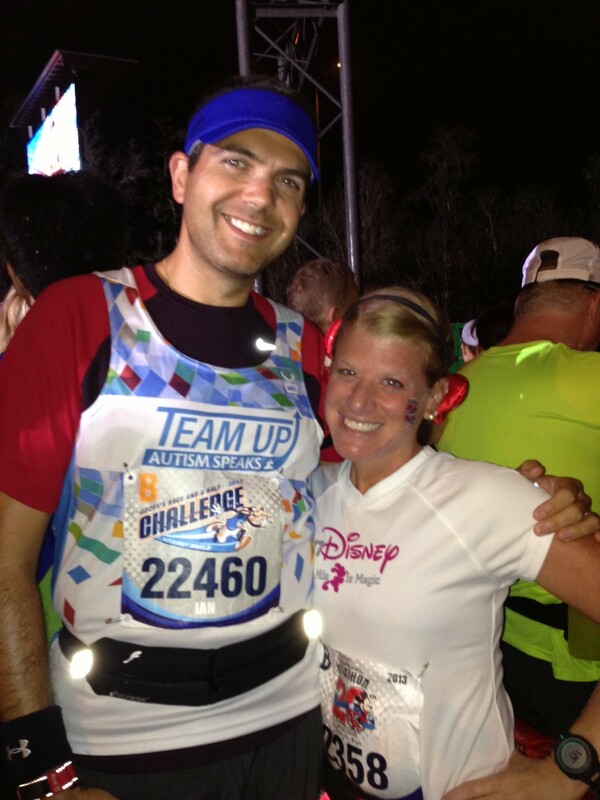 We finished in 5:28. Nowhere near my 3:59 in Philadelphia 8 weeks prior but much more fun and rewarding. 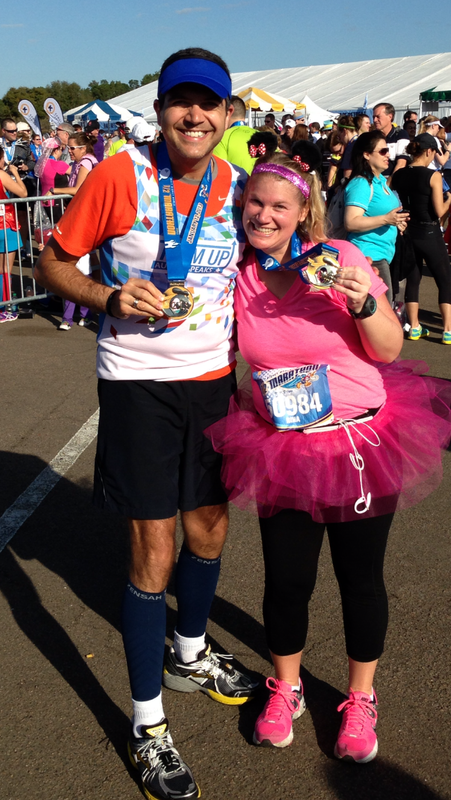 I ran the whole distance with my wife and best friend. Awesome. 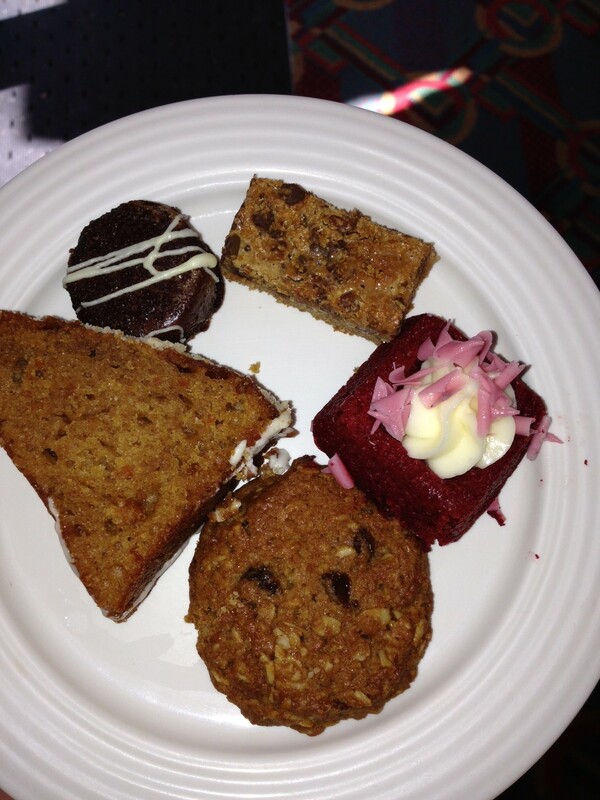 First stop after receiving our medals….self treatment. Ice had never felt so good. We sat there for 20 or 30 minutes. It was a sense of relief. Shari was texting with Rina and her parents and I was chatting with the same guy from NJ I had met in self treatment yesterday. We were done. We made it over to the Goofy tent to get my medal and headed out to meet up with our friend Beth who had finished about 20 minutes ahead of us. Then we had the very long walk across the parking lot to retrieve our car. Funny, I think the walk helped actually. Other than being tired and a little sore I felt better than when I ran my first marathon back in 2011 and I had just run 39.3 (or 42.4 but who’s counting). I guess all the training paid off. Thanks for sticking with this for so long. 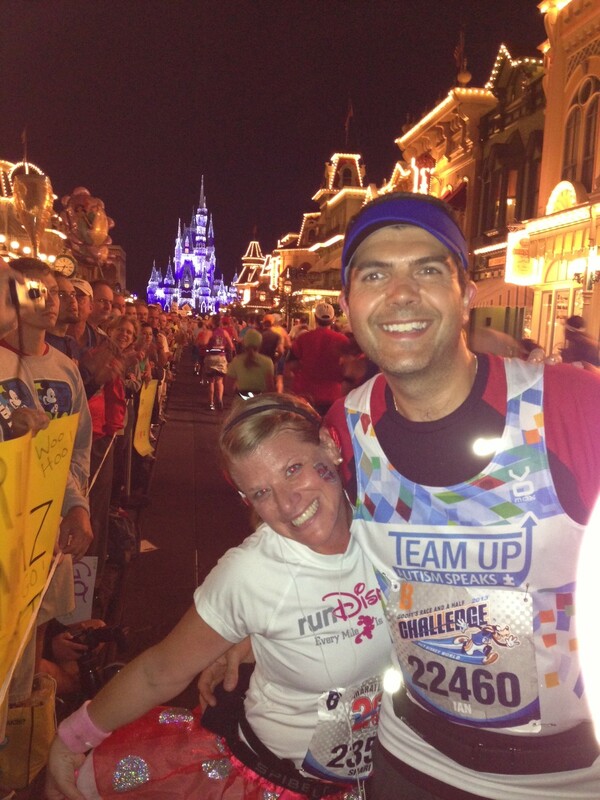 If you made it to the end of this post you can probably feel you read a Goofy Challenge! Beep…Beep…Beep…yup, that was the sound at 2am (not that I hadn’t woken up just before my alarm to make sure I didn’t miss the alarm). Having set out all my gear and pinned my Goofy bib to my race shirt the night before I got myself up and prepared. There is nothing like getting up at 2am and putting on sunscreen, eating a Power Bar and drinking Powerade Zero to start your day. It was an extra early start today as I was going to the race this morning with my sister in law Rina who was running her very first Half Marathon. I did the gentlemanly thing and got up earlier so she could have an extra 30 minutes sleep and get out of the bathroom so she had time to get ready. Anyway, we were out the door and headed to the car 3:15 (a little earlier than planned). It was a little foggy as we got closer to the park but at least I didn’t miss the exit today. We got there about 3:45 in a good parking spot not too far from the start line entry and immediately got in lines for the port-a-potties (as you do), took a few pictures and headed to bag check. Once through we again hit the bathrooms just as they started calling the runners to the corrals. 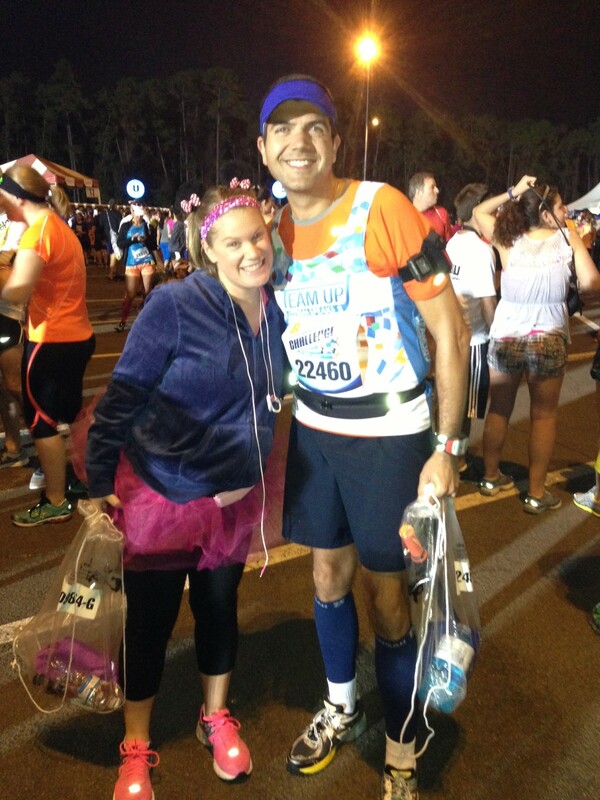 Rina and I arriving at the Half Marathon staging area. As we walked along to the corrals Rina and I chatted until we had to split into our respective corrals. Luckily she met up with some other first timers and I left her in their care. So much for us having to be in the corrals by 5am…I didn’t make it there until 5.20am just as they sang the National Anthem. I jumped into the corral and waiting for corral B to be called to the start line. I recognized Lee Hoedl (the guy who makes those awesome videos) and we took a quick picture together. I had made a conscious decision to enjoy myself this weekend so I took my iPhone with me and was ready to take the run easy and stop and take pictures. I did take a few pictures during the Marathon last year but I was still looking at a time as that had been my second marathon. As I was doing the Goofy for charity this year I decided to just enjoy myself and make sure I made it to the finish line on Sunday. The fireworks went off and we made our way across the start line. Within the first 100 yards or so it was “Uh oh…hello right knee. Thanks for turning up”. Oh boy…only 39.2 miles to go! I went easy, this was not a day to PR anyway so may as well make it as enjoyable as possible. 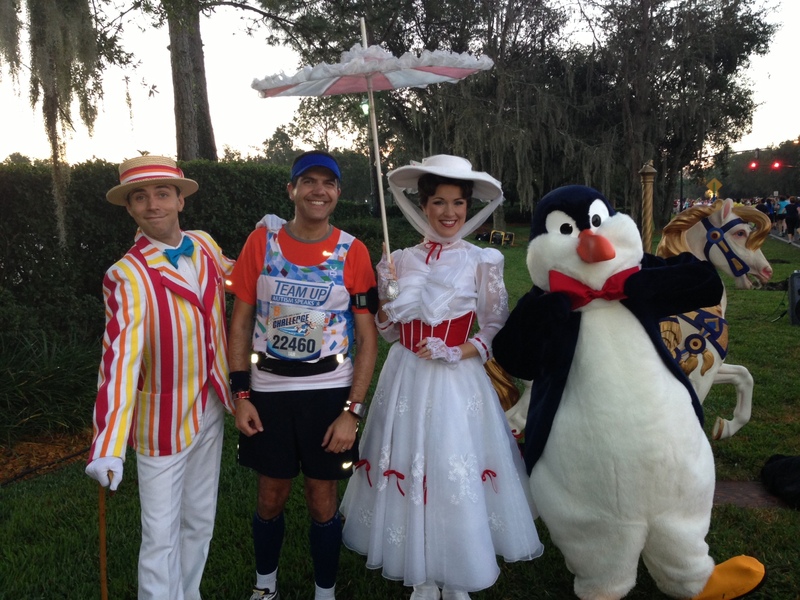 Last year during the marathon we ran through the Magic Kingdom around mile 10 and it was light by that time. 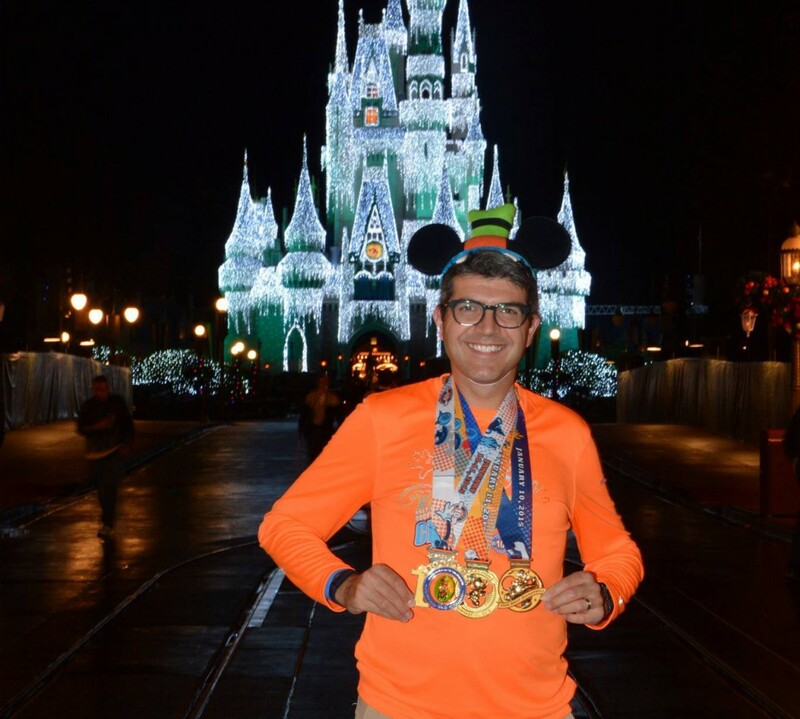 This year the Half Marathon and Full Marathon followed the same course through the Magic Kingdom and so we hit the Magic Kingdom around mile 6. I have to admit that the first few miles seemed to go really fast. Perhaps it was the anticipation of entering the Magic Kingdom. I made sure to take photos with Captain Jack Sparrow and Jack Skellington as these are some of Micah’s favorite characters. I don’t know how to describe the feeling of running up Main Street USA with all the lights and seeing Cinderella Castle all aglow without telling you you have to be there for yourself. It’s magical when you visit the park but it is even more special and I would say emotional while you are running there as the adrenaline and excitement of entering the park is so different from a regular visit (no fiddling with tickets, going through security or pushing a stroller). The noise of the crowd contributes to the whole experience. 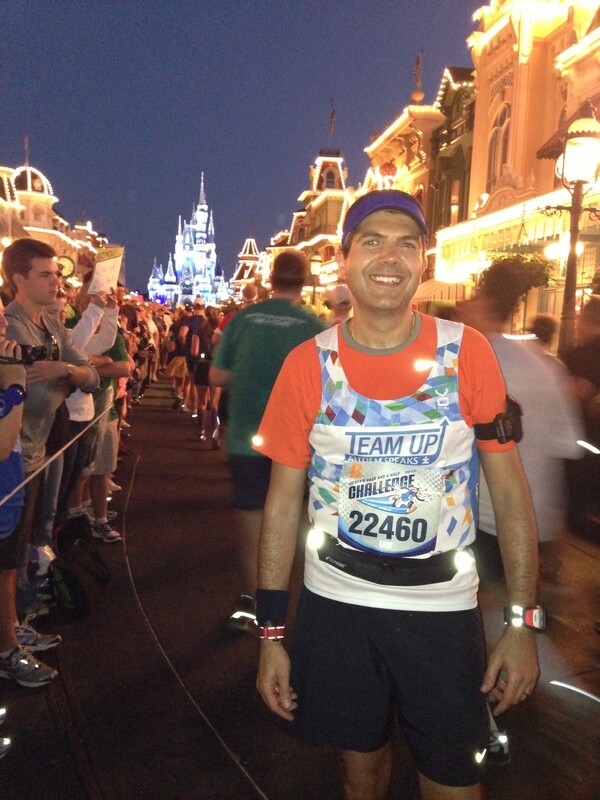 Last year I ran through the park and stopped for a picture in front of the castle. This year I made sure to stop and take pictures and soak up the atmosphere. Truly magical. 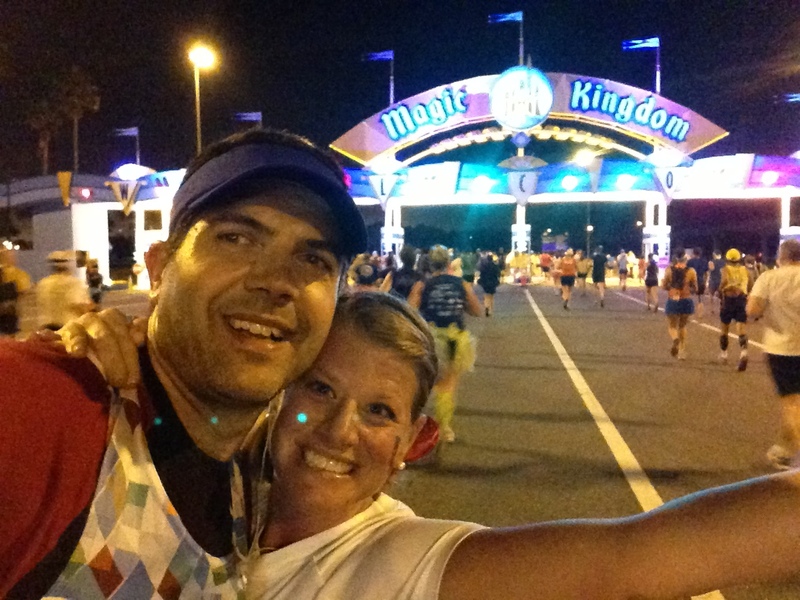 After running through the Magic Kingdom the course takes you back to EPCOT. There is not too much to see once you leave the Magic Kingdom and it does get a bit narrow along the course in places. I made sure I got my photo with Mary Poppins this year. I didn’t have my camera last year and this was one photo I was sorry to have missed in 2012. 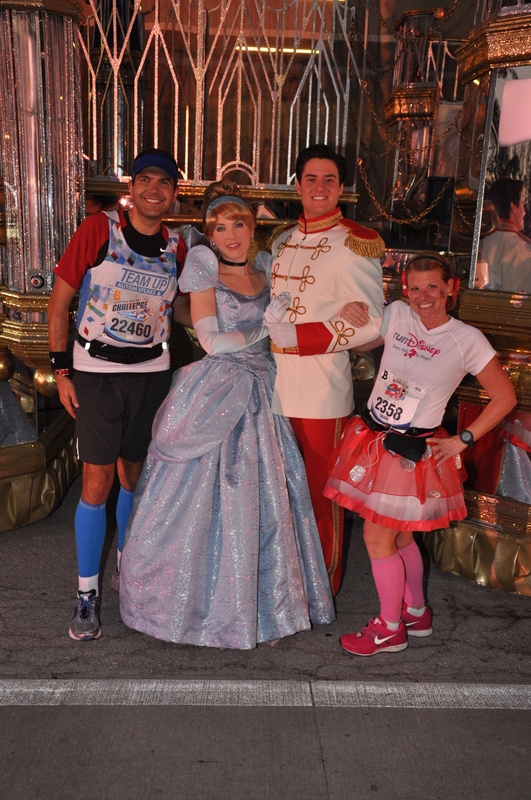 The runDisney folks do a great job in keeping you entertained with music and character stops. I made sure that I saw the TeamUp cheering squad just after mile 7. The sun was coming up and we all followed the herd up the overhead ramps on our way back into EPCOT. With very few character stops on the way back I could start to settle into a consistent mile pace. Around mile 10 I finally had to stop at a med tent and enjoy some of the complimentary BioFreeze which finally began to work its magic as I approached the 11 mile mark. Once all was working right again (or at least I couldn’t feel it wasn’t working right) I picked up the pace. I stopped one more time to take a picture with Phineus and Ferb before high tailing it into EPCOT. My legs felt fine so I thought I could run in….which I did only to feel something tweak in my right foot. I made it across the finish line and received my Donald medal and taking advice from some of the blogs I had read, headed over to the self-treatment area to apply some ice to all the achy bits for 20-30 minutes as I waited to meet up with my sister-in-law Rina. Aaaaaahh. That feels so good. Once through the bag check I sat on my runDisney mylar blanket and used my foam roller stick on my legs, ate and drank and just chilled out in the shade of the tent and followed Rina’s progress on Facebook. When Rina came through the bag check she was clearly very emotional having completed her first Half Marathon. She looked so happy (and relieved) and I was so proud of her. Once we both calmed down a bit we headed back to the hotel to shower and change and then we all set off for Hollywood Studios. At Hollywood Studios we had a character dine booked at Hollywood & Vine. It was with the Disney Junior characters which my boys both loved. We ate there after the Half last year and I remember it was a great place to re-carb. I think I ate my body weight in mac and cheese. It was so tasty although I made sure to leave room for dessert (two portions). This gluttony probably is the reason I fell asleep during the Handy Manny section of the Disney Junior show… the 2am wake up probably also helped. We chose Hollywood Studios as our Saturday park as we knew we would be hitting the parks but this had an earlier closing time than the others so we tried to plan appropriately. We were still there at the close of the park too. I knew I had to eat a little before heading to bed but didn’t want another huge meal after my lunch adventures so we ended up grabbing some bakery items including the giant Mickey peanut butter cookie you see in the picture below…hey, doing the Goofy Challenge any carbs are good carbs. Before we left the park for the night Shari had been shopping and had bought a completely different outfit to run in for tomorrow’s Full Marathon. Either way tomorrow would be an exciting day for all of us. Shari told me that once my head hit the pillow that night (probably sometime around 10pm) I was out like a light. Never ever happens to me but I’ll take it when I need it.